Another spring day, another use for asparagus. 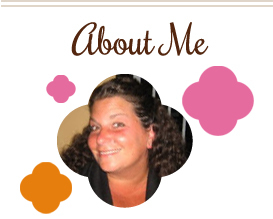 And this one is a new favorite! This dish was seriously delicious, even with “thinning it out” by using fat free half and half in place of heavy cream. I was a little worried that it wouldn’t hold up, but fortunately I was wrong. It was creamy and flavorful and perfect. And while we’re talking about spring days, what’s up with this weather? 80 degrees yesterday…a predicted 93 degrees today…I can’t believe I’ll be turning on the AC in mid-April. I want my spring back!! Cook pasta according to package instructions. Meanwhile, cut bacon into bite size pieces and fry in a large skillet. Once cooked, drain most of fat out of pan. Cut asparagus into penne shaped pieces then add to pan. Add garlic and pepper and toss together. Mix egg yolk, half & half and cheese in a bowl. Set aside. Drain pasta, reserving a little bit of water. Add pasta to pan and toss. Remove from heat and wait for sizzling to stop. Add egg mixture and toss to coat. Taste at this point and decide if you need to add reserved pasta water. I didn’t need to, but if you do, add slowly, then toss. Top with more pepper, if desired, and serve. 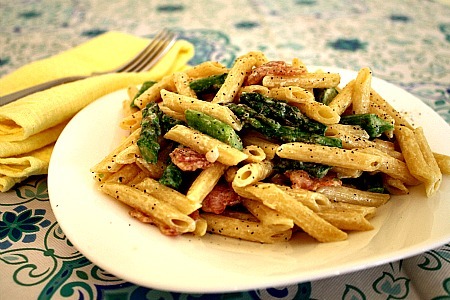 This entry was posted in asparagus, cheese, garlic, main dishes, pasta, QuickAndEasy. Bookmark the permalink. I love new uses for asparagus, especially with bacon. I’m also just learning how delicious pecorino romano is. Yum! This looks delicious! I have a hunk of pecorino romano in the fridge and this might be the recipe it gets used on! I’ve made this before and really love it! Asparagus is the perfect compliment to the eggy sauce!